Before the start of the scenario, I had previously chosen to take the two radar technology upgrades. 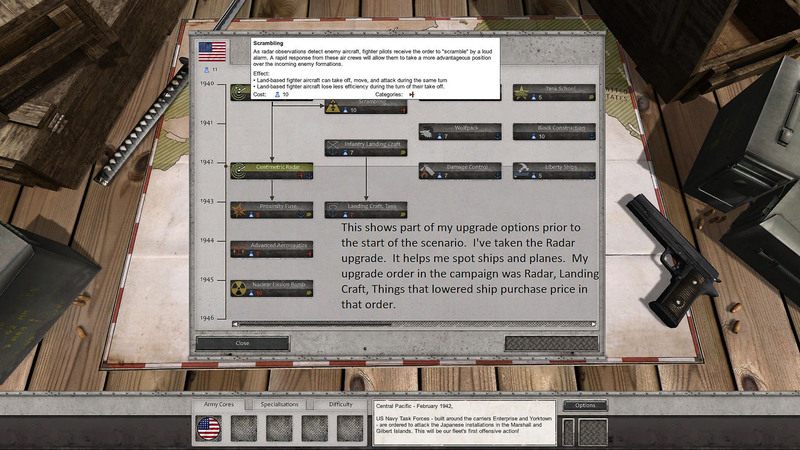 The radar technology purchases were useless in the earlier land scenarios, but better radar allows both planes and ships to locate bogies at much longer ranges. I knew the radar would be vital for the 1942 and later naval battles. The objectives for the scenario range from the easy to the very difficult. You can “win” the scenario by not having either of your two carriers sunk. 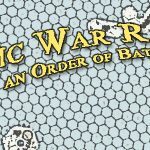 Another secondary victory condition is not suffering damage to your carriers. 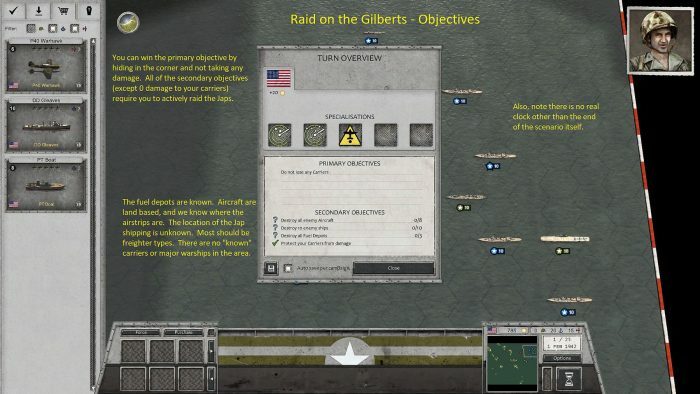 Staying away from the Japanese islands and not performing the raid would achieve these objectives. The other three objectives are much harder. You get advantages in future scenarios if your forces can destroy the four Japanese oil depots and shoot down the Jap planes based on four widely separated air strips. The oil depots and air strips are known. 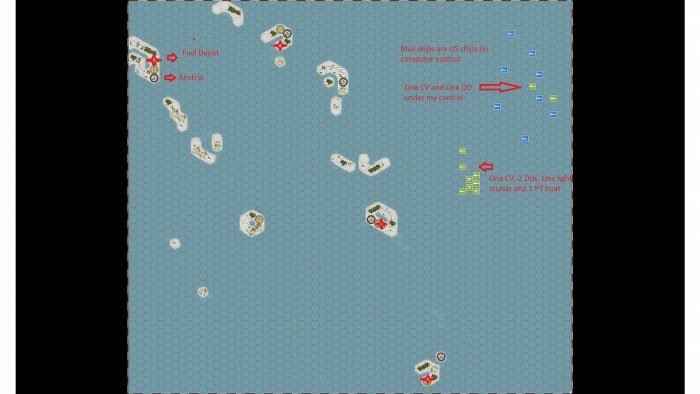 The last secondary objective is to sink ten or more enemy ships. I don’t know how many Jap ships are out there nor do I know where they may be lurking. 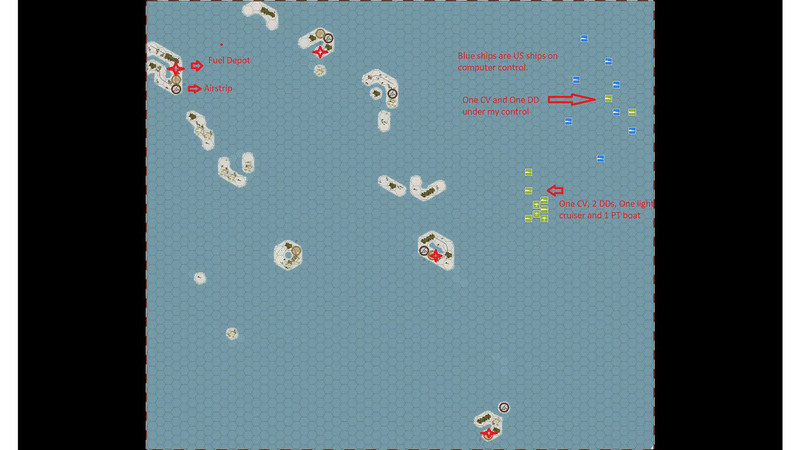 If I kept my carriers in one group it would be almost impossible to destroy all of the Jap aircraft and oil depots. The targets are too far apart. I decided to split my carriers into two very small task forces: task force Black and task force Red. Both carriers have three air wings (one fighter, one dive bomber and one torpedo plane). Task Force (TF) Black starts with a carrier, a cruiser, two destroyers and a PT Boat. TF Red has a carrier and one cruiser. TF Black will hit the closest island and destroy the aircraft, oil depot, and any detected shipping. Then the PT Boat will be sent North to join TF Red while the rest of TF Black steams South. TF Red has further to go to reach a launch point for its first target. TF Red will stay in the North and hit three islands in succession. 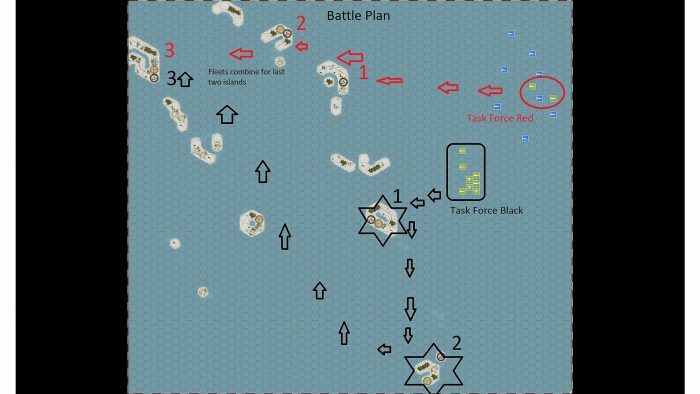 TF Black will be steaming much further and is ordered to rejoin TF Red to jointly attack the last Japanese air strip and oil depot after they destroy their first two objectives.